For the last two years, I have been really happy, living without a definite calendar. I just knew I had a meeting with my boss "next Monday", or had a workshop somewhere "in the last weeks of January". But these days I've come to realize I just need a calendar now... And finally managed to mix org-mode's events with standard emacs calendar+diary views. This calendar is emacs calendar's mode standard one (I love its looks) but harvests information from org-mode's headlines and timestamps. 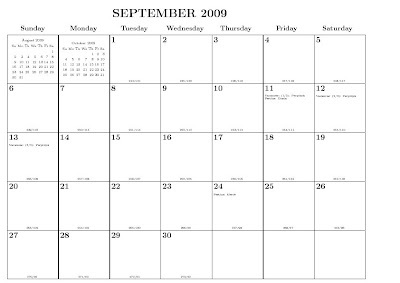 I can now have the best of both worlds: a nice printed calendar (calendar mode), and a nice computerized one (org-mode). And the useful options are :timestamp, :sexp, :schedule and :deadline, to select which things to show. The initial problem is the :sexp as default, it won't work with non-diary (org-mode's) diary entries.